Though they had one of the most sadly unadorned booths on the Detroit Auto Show main floor, nobody really cared, as Shelby introduced three new 50th anniversary cars today: the GT 500 Super Snake, the 50th anniversary edition GT350, and a 50th anniversary edition GTS. As a quick glance almost anywhere on the car will tell you, the three Mustang-based cars are being built in limited quantities to commemorate Shelby's 50th anniversary. The cars will be built in limited numbers — 50 black and 50 white of each of them, for a total of 300 cars. Each car will come with gold striping (to celebrate, they say, the golden anniversary) and a bunch of pomp and ceremony, including a special factory event in Las Vegas, VIN number solemnly recorded in what I'm imagining is a big, leatherbound book, and various collector merchandise. Probably a key chain, too. Other than the planned rarity, the big news is the power, of course. 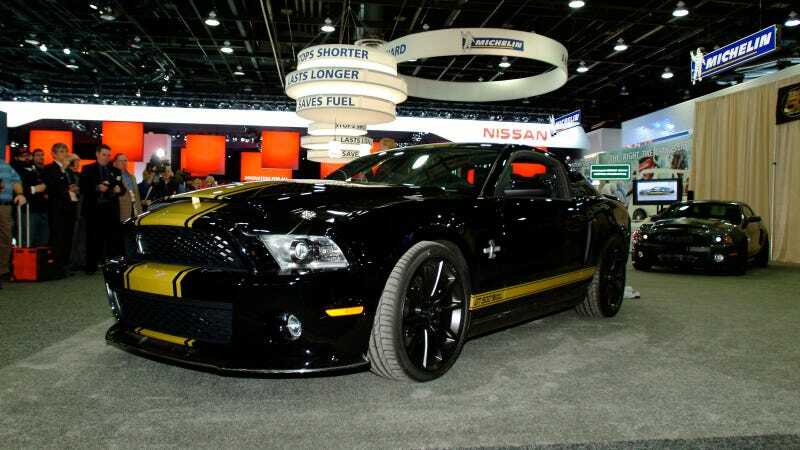 The top-of-the-line Super Snake comes standard with 750 hp from its supercharged 5.0L V8, and can be optioned to produce a nicely bonkers 800 hp. There's some extra carbon fiber spoilers and 6 piston front brakes, and the 50th Anniversary badge stitched into the seat backs, floor mats, and on pretty much every other surface you're likely to encounter. What's the point of a special limited edition if nobody knows, right? It starts at $59,995. The 50th Anniversary GT350 uses the same 5.0 Coyote engine, but in 430 hp, 525 hp, or 624 hp states of tune. Like the others, it has all the 50th anniversary badging and all the accessories, including the interesting detail of having "1967-1968 Mustang-style backup lights." It can be had naturally aspirated for $26,995 or supercharged for $33,995. The entry-level option into this limited club is the GTS, the only of the three that can be spec'd with a V6, a $9,995 option in addition to the base Mustang itself. It has a slightly less gaping maw and hood treatment than its pricier siblings, and makes either 305 or 475hp with the 6, and 430, 525, or 624 hp with the V8. There's no doubt Shelby makes some very fast, capable cars, and if your dream has been to own one that only 299 other people have, now's your chance. Have at it.